The time to stop Don’t Ask, Don’t Tell is long past! That very handsome man in my uncle Alan. To the world he’s better known as, Rear Admiral (ret.) Alan M. Steinman, MD. Okay, I added on the MD but he is a doctor! My uncle is an amazing person. Here are a few reasons why (and my other uncles are amazing, too). Alan is a retired officer of the United States Coast Guard and the Public Health Service. He worked in a variety of locations as a flight surgeon and became one of the leading experts in the world on hypothermia. He was the equivalent to the Surgeon General for the Coast Guard during his career and served in a variety of capacities. One of the most notable roles Alan held was his position as Chief of Wellness for the Coast Guard in which he oversaw a variety of programs. 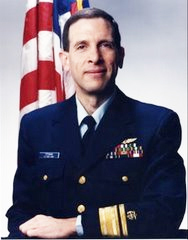 After the first Gulf War and Uncle Alan’s retirement he was appointed to the Presidential Special Oversight Board for Department of Defense Investigations of Gulf-War Chemical and Biological Incidents, where he served under Senator Warren Rudman (R-NH) as the chief medical advisor for the Board from July, 1998 to January, 2001. He has a really impressive biography. You can read it here. My uncle Alan also attended every graduation ceremony I ever had. High school, Brandeis, my M.A.H.L. and my rabbinic ordination, he was always there cheering me on. Uncle Alan also created a Steinman family tradition, the elevator dance. I cannot disclose this dance it is truly something that must be witnessed. As the oldest niece it has been my familial duty to ensure that each of my cousins have learned and perform the elevator dance. No there will be no videos either. When Uncle Alan retired from the Coast Guard my dad went in support. We all wished we could be there in support but school was calling. Uncle Alan also is a gay man. He was unable to come out publicly and even privately to our family because of “Don’t Ask, Don’t Tell,” a 1993 law established by Executive Order of President Clinton. After a highly decorated military career, Alan couldn’t afford to be discharged from the Coast Guard in this manner. Five separate times federal courts have upheld DADT. Upon his retirement from the Coast Guard, Alan was able to come out to his family. In 2003, the 10th anniversary of DADT, Alan became the highest ranking military officer to self-identify as gay. He has appeared widely in a variety of venues about the problems of DADT and the tremendous negative effects it has on the military, service members, and our entire country. Last night in his State of the Union address, President Obama used 38 words to address DADT. He said, “This year, I will work with Congress and our military to finally repeal the law that denies gay Americans the right to serve the country they love because of who they are, it’s the right thing to do.” This was a nod to the cause and now it is time for us to raise our voices. You can visit the SLDN and HRC for more information. You can rest assured that I will use this blog to let you know when it is time to phone congress and write faxes and emails. I hope that you can see from take away from this post that DADT doesn’t just effect ‘people’ in some abstract way. I am talking about people who want to serve their country and continue to be denied the opportunity. It is discriminatory. It is wrong. It cannot be tolerated any longer. No person should have to wait to come out to their family because they are serving in the armed forces. It would be wonderful if one day I could talk about my uncle Alan and could talk about all the work he needed to do to end discrimination as part of a history lesson. Let’s all work together to make that day come sooner. Oh and most important, I love you Uncle Alan! 2 Responses to The time to stop Don’t Ask, Don’t Tell is long past! Beautifully written. We are all proud of Alan’s articulate advocacy of ending the terrible”Don’t Ask Don’t Tell” policy. It should make us all ashamed that our government has allowed this to prevail. While you may be seen as having a bias because Alan is your uncle, let me tell anyone reading your blog that everything you have said about Alan is true. He is an extraordinary human being – brilliant, sensitive, compassionate, passionate. Let’s hope that he and the many others who have experienced this terrible discrimination will see the promise of President Obama fulfilled.